I’m writing again. And that means that most spare scraps of the day are poured into that work … and not into, say, doing the dishes, prepping supper, photographing my adorable children, or blogging. Gee, I still dislike that term. But can’t think of a better one. Saturday, so we arose late, hoping CJ would sleep in (he did, a bit, following a just-before-seven nurse), and that the other children would go downstairs and play together (they did), and that they would FEED themselves. They didn’t. Inevitably, hunger arrived, wasn’t addressed, and led to an argument between Fooey (age four) and Albus (age eight). Over Duplo. Apple-Apple, meantime, has been in the position pictured above since waking this morning, save for a brief breakfast out of bed. It is now almost eleven. 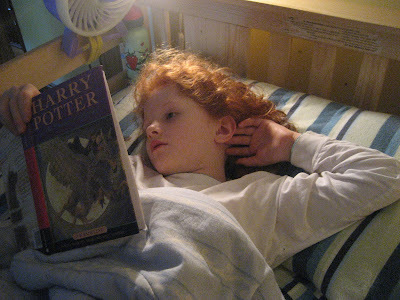 She’s reading the Harry Potter series at a rate of about a book per week, and is already on book three. Surely there is poetic justice in me having a daughter who cannot remove herself from a book–I get to understand first-hand how difficult that can be to watch. I fight the urge to jump up and down waving my arms while telling her: look at this wonderful world; don’t you want to go play road hockey with your brother? ; wouldn’t you like to chat or something? But she’s lost in this other place. She doesn’t even blink. Yup, like magic. I get it. I hope I’ll get there again, myself. I read all day long, but not in the same way. I skim the newspaper, dash through emails, scan other people’s blogs, troll through recipe books, I read aloud to the kids, process the endless stream of info that arrives in backpacks from school, lie in bed and savour a chapter or two in a personally chosen book before sleep arrives. Much of life revolves around text. Reading isn’t dead. But falling so deeply inside a book … that feels beyond my capacity to manage right now. There isn’t enough room, enough space in the day. Made it downstairs. Have now breakfasted and self-caffeinated. Laundry is on the list, as is vacuuming. Unless I get called to doula at a birth! My friend is due–was due–this Thursday past. Every time the phone rings, Kevin looks at me and I look at him–is this it? Do any of you have Sigg water bottles? If so, the company is doing a voluntary recall due to tests that showed their old liners were leaching a nasty chemical. This week, we replaced a family’s worth of rather battered bottles for pretty new ones, which have a different liner. Which will leach heaven knows what, but hey. Better than disposable. Blue Skies Yoga and Eco-Store will exchange your bottles, no questions asked. That’s Apple-Apple’s brand-new ladybug bottle behind her in bed. Always hydrate while reading. I can relate to the toys. I often think we have too many. I just took a bunch to Generations/Second Time Around last week. Still have lots to get rid of. Do the toys multiply when I am not looking? I love that Apple Apple is lost in her books. I hope my kids are like that when they can read on their own. Thanks for the info about the SIGG bottles. We have one to return. I love this, for so many reasons. I love the picture of A-A, and I bet she and I could chat happily about our shared love of Harry Potter; it’s a world I am not embarrassed to say I like to visit when this world weighs too heavily. And I get the decluttering too. Spent hours on it last night. The issue here is to actually *find* a place for everything.